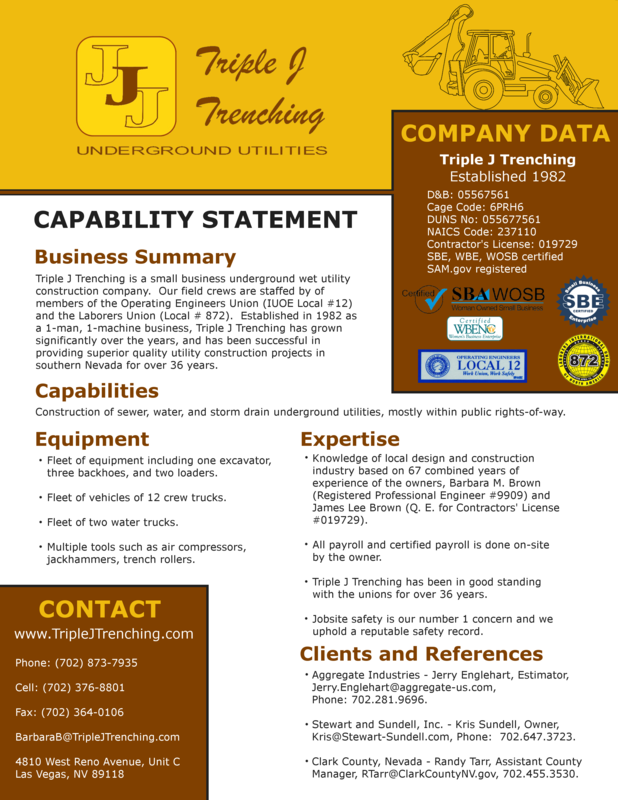 Triple J Trenching is a small business underground wet utility construction company. Our field crews are staffed by members of the Operating Engineers Union (IUOE Local #12) and the Laborers Union (Local #872). Established in 1982 as a 1-man, 1-machine business, Triple J Trenching has grown significantly over the years, and has been successful in providing superior quality utility construction projects in southern Nevada for over 36 years. Construction of sewer, water, and storm drain underground utilities, mostly within public rights-of-way. Fleet of equipment including one excavator, three backhoes, and two loaders. Fleet of vehicles of 12 crew trucks. Fleet of two water trucks. Multiple tools such as air compressors, jackhammers, and trench rollers. Knowledge of local design and construction industry based on 67 combined years of experience of the owners, Barbara M. Brown (Registered Professional Engineer #9909) and James Lee Brown (Q.E. for Contractor's License #019729). All payroll and certified payroll is done on-site by the owner. Triple J Trenching has been in good standing with unions for over 36 years. Jobsite safety is our number one concern and we uphold a reputable safety record. Aggregate Industries - Jerry Englehart, Estimator, Jerry.Englehart@aggregate-us.com, (702) 281-9696. Stewart and Sundell, Inc. - Kris Sundell, Owner, Kris@Stewart-Sundell.com, (702) 647-3723. Clark County, Nevada - Randy Tarr, Assistant County Manager, RTarr@ClarkCountyNV.gov, (702) 455-3530.